CAF & CS DEPARTMENT – Conversion of Fair Price Shops into Village Malls – Terms and Conditions of MoU with the suppliers of FMCG., products for Village Malls – Approved – Orders – Issued. Note from the VC & MD., A.P. State Civil Supplies Corporation Ltd., dated:16-04-2018.
products for Village Mall Initiative and the work order has been issued accordingly vide work order Lr. No. Mktg. M6/4222/2016, dated:07-11-2017.
conditions of MoU after having elaborative discussions during the meeting. in ensuring that the identified FPS sites are aware and cooperate during execution. basis will take a maximum of two weeks and once Reliance Retail initiate the rolling program; Reliance Retail should target to do 175 in each District every month or about 50 a week per District. Reliance Retail have incurred a capital expenditure of about Rs 3 lakhs per Pilot store; based on the 10 Pilots done so far. The actual costs could vary by site. 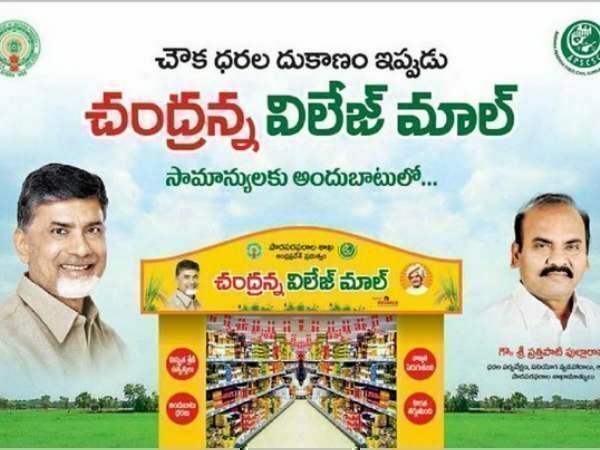 Reliance Retail recognize that our commitment was towards store branding fixtures as also retail shelves and fixtures; and to cover the balance costs; the AP Government has held discussions on providing part support by the AP government + arranging support under the MUDRA scheme for the FPS owners. There are challenges in this and this may delay the process as also make it administratively inconvenient to execute so many small loans for the FPS owners. Reliance through EMI adjustment to the Monthly Income from the sale of items. Considering that Reliance Retail need to keep the monthly EMI low and in context of the proposed changes; Reliance Retail request that Reliance Retail make the FPS initiative a committed 5 year program. work towards introducing modified packs of Staples which meet the standard quality and price benchmarks as used by bulk of the consumers served by FPS. Reliance Retail will ensure that our quality standards are better even as Reliance Retail offer competitive prices. Reliance Retail is in the process of reviewing the list of FMCG products that are kept in the stores; and will adapt as required. A list of preferred 300+ FMCG items has been shared and Reliance Retail will work on making these available to the stores on priority. On an ongoing basis, the entire catalogue of over 15,000 lines will be available for the FPS owners to order from. The Point of Sale Devices that Reliance Retail have deployed will support this and Reliance Retail will support the FPS owners in understanding and using the capabilities. Reliance Retail will execute a system wherein our team will continue to engage with the FPS owners across Districts and take their feedback on what items they want to keep and also what is appropriate market benchmark rates; so that the range of items sold and sales is always improving. the stores can quickly mature to support sales of 3-4 lakhs at least a month. Reliance Retail will provide the FPS owner the required inventory credit of up to 2 lakhs to cover expected inventory investment for this level of sales. and adjustments and payment to FPS owner towards their margins net of any adjustments; Reliance Retail will detail separately. able to establish a full DC / Warehouse in every District Headquarter. Reliance Retail would then use these DC’s to cater to all the FPS sites in the District. 3. After careful examination of the entire matter, Government hereby approve the proposal with reference to the terms and conditions of MoU, subject to condition that to incorporate the following under clause Capital Expenditure and Support while entering into MoU with Reliance Retail Ltd.
-Reliance Retail Ltd., will bear 100 % cost of branding & fixtures/shelves. such land allotted shall be borne by Reliance. 5. The Vice-Chairman and Managing Director, A.P. State Civil Supplies Corporation is requested to take necessary action accordingly.